Yesterday I shared a bit about the story of St. George and the dragon Now Michaelmas is viewed as a celebration of the harvest as well as the slaying of the dragon. Waldorf Schools like to focus on slaying your inner dragon. I will share a few more dragon books with you and also go check the posts at Seasons of Joy on Taming the Inner Dragons, so far she has done Guilt and Responsibility, Fear of Failure, Fear of Success and Anger. 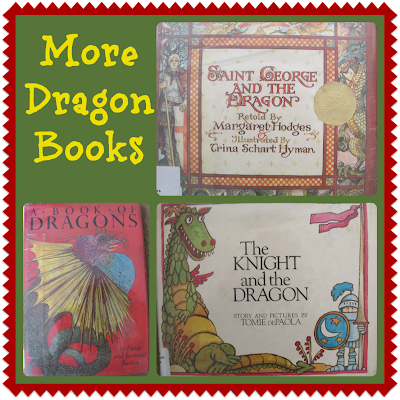 Saint George and the Dragon retold by Margaret Hodges is the story of St. George and the dragon. I found it a little above the level for Hazel's understanding and will not read it to her. However for older children it would be great. A Book of Dragons by Hosie and Leonard Baskin gives summaries and a picture of various dragons throughout history including St. George and his dragon. I will read this summary to Hazel. The Knight and the Dragon by Tomie dePaola is a cute tale about a knight and a dragon who go to fight one another and have a few issues. In the end they open a restaurant together. I'm still waiting for three more dragon books from the library. Hopefully I will get them by Saturday. I will let you know if they are any good if I do. I also have Hazel's things ready to reenact fighting the dragon. 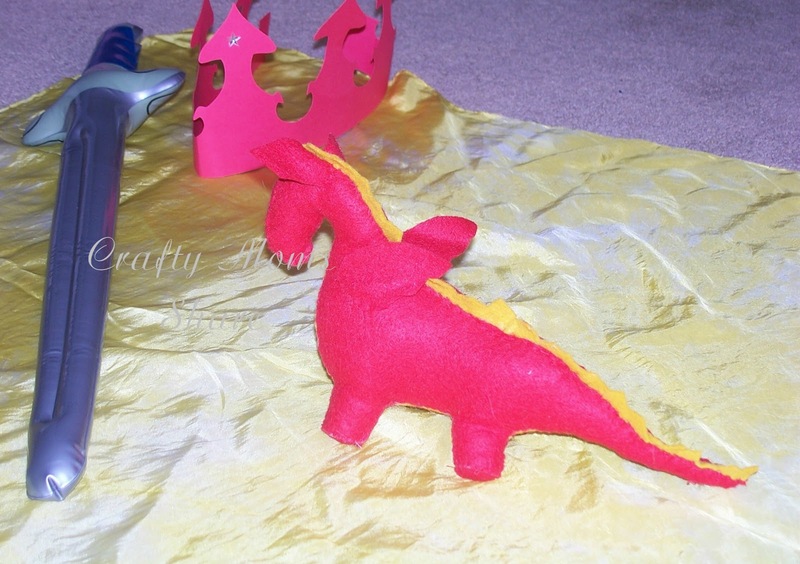 We have her sword (inflatable, but traditional Waldorf would be wooden), a yellow cape, a crown and of course a dragon. I just told Steve maybe we would make him a dragon costume and have him dress up as the dragon. Hmmm, come to think of it we have a dinosaur/dragon costume in Hazel's dress ups. I wonder if it will fit him. We'll see if he will go along with it. I think I will try this recipe for Harvest Apple Soup. I'm not sure Steve will like it but it sounds like something Hazel and i will love. We will also make dragon bread as I described yesterday. Our plan is to make it with our huckabuck bread recipe from our parent/child class last year. Then since none of us really like blackberries, I think I will serve either a raspberry tart (I have one in my freezer that we need to use up) or an apple pie. I also plan to make some salt dough to make some dragon and autumn decorations. Last year I shared a pretty good round-up of dragon crafts if you are interested. Depending on how Hazel is feeling, we will see what we get done. 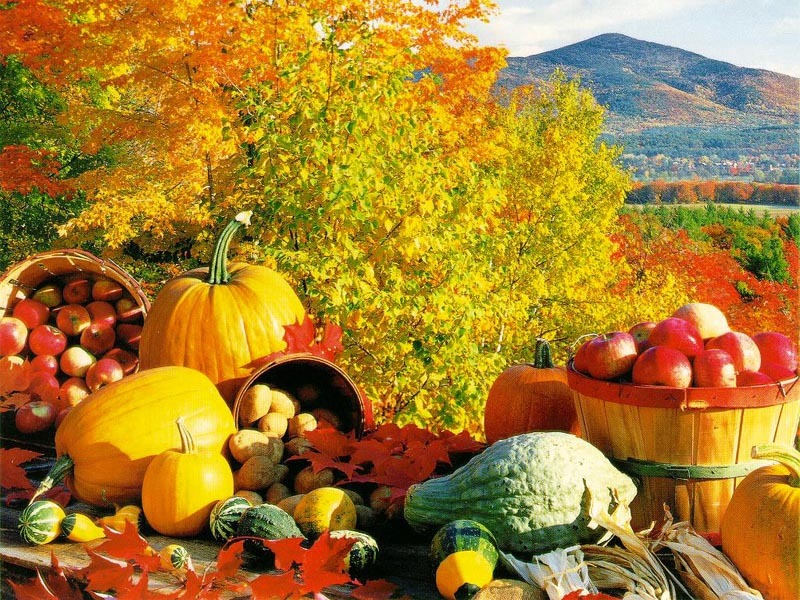 You could also do a harvest or fall craft. 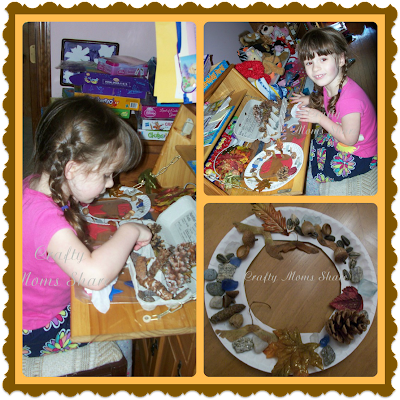 Above I shared a simple natural (or mostly--we used fake leaves) autumn wreath. 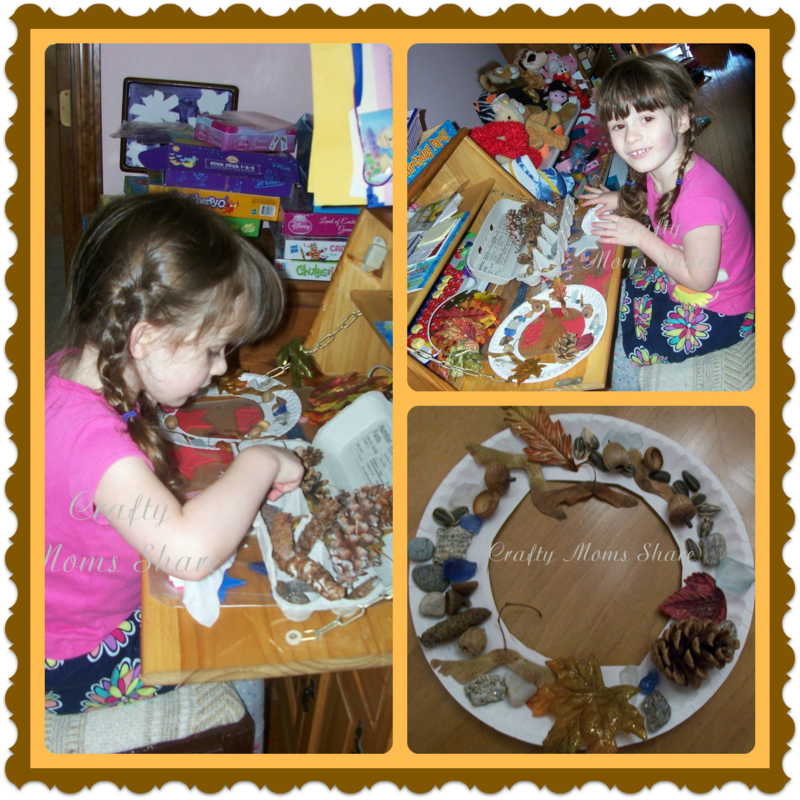 Hazel just glued some things onto a paper plate that I had cut out the center. Most of the things were found on nature walks. Well, I hope that gives you some ideas on celebrating Michaelmas! Enjoy! !